The university of Madras is one of the most reputed along with being the oldest universities of India and Asia. The university lies opposite the Marina beach, making for a highly pleasant location, for both study and leisure. The highlight of the university apart from great courses is the Indo-Saracenic architecture (a blend of the Indian and Persian architecture) of the Senate House. Apart from this building there are several other old buildings inside that make for a beautiful vista to stroll around, especially in the evenings. 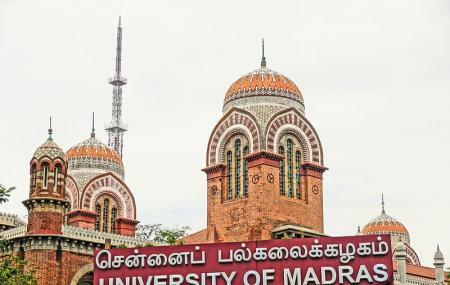 How popular is University Of Madras? People normally also visit VGP Snow Kingdom while planning their trip to University Of Madras. University situated near the Marina beach can be accessed from railway station easily. University canteen has nice n affordable food. Some of the staff is bit harsh though they provide services aptly. They are providing different type of course in regular and distance education. Since 1857 , they are providing good education in 159+ year's. Large main block and canteen foods with average cost. Enquiry counters there staff guiding people's properly, Offline Application, fees payment, , book issued, ID card provide in one building with different counters. One of the oldest and renowned universities of the continent. Wide range of knowledge diversity to study various arts and science courses. Best place to do inter disciplinary research in science. And some rare courses like archeology, geology, cyber forensics, many more social science courses and literature courses are available here. Best place to start your studies.